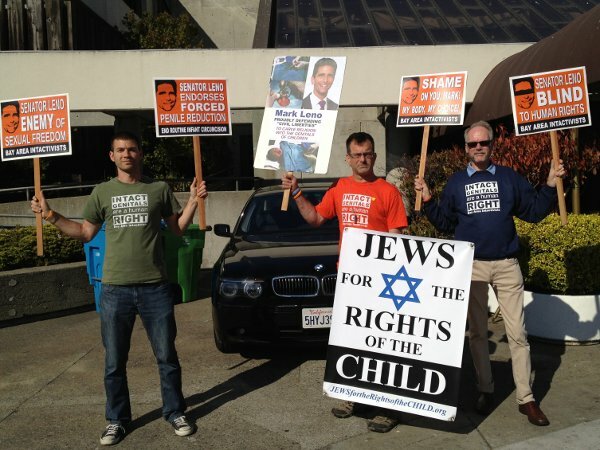 Yet another re-election fundraiser for California Senator Mark Leno was marked by the presence of protesters outraged by his opposition to the San Francisco Male Genital Mutilation Bill and his endorsement of AB 768, the California law which prohibits any city from restricting circumcision to consenting adults. A half dozen members of Bay Area Intactivists held signs at the entrance to One Ferry Plaza Restaurant where the fundraiser took place at the end of June. Even one of the restaurant's parking valets briefly held a sign to show support for the protest.